Keeping Up With The Joneses: Naughty or Nice? Or maybe a little of both! Last Wednesday we went to visit the Man In Red...also known as Santa! You know how us Joneses like to roll. We like hitting Santa up early in the season for several reasons. Short line, more time with Santa, he's not all "germed up" yet, blah blah blah. BUT the real reason is because we are ready to get the Christmas party started. 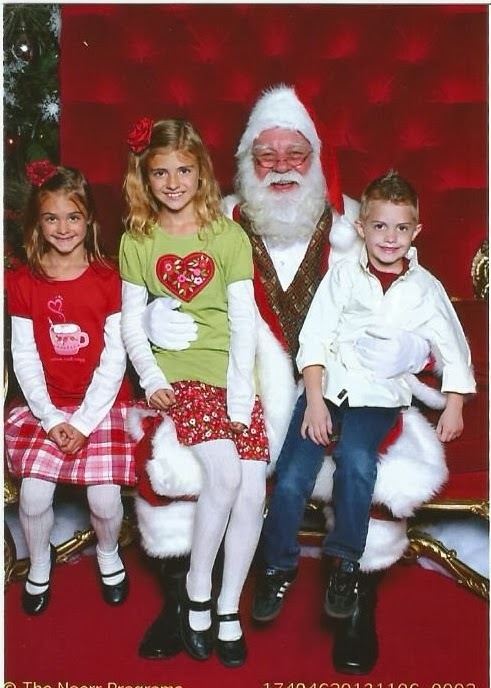 We LOVE Christmas and visiting Santa is our own little way of getting the season started. I do realize there is a Thanksgiving celebration before Christmas, but I like to think of them lumped together so we have a longer time to celebrate. This one was Santa's idea. He told the kids to make their best Grinch face. Here's a few pictures I took...you have to buy one of their packages to take your own photos (the two photos above we bought). Silly, BUT I did get a special package deal that included a super cute light up frame. I'm such a sucker sometimes! Sydney asked Santa for Lego Friends and a Nerf Gun. Jordyn made up her mind on what she was asking for as she walked into the mall. She asked for a Kindle Fire and a Webkinz monkey. Bryce has known for about a month now what he wanted to ask for. A toy train to go around the Christmas tree and a remote control monster truck. He even got specific (yah!) and wants a red monster truck with black racing stripes. After our visit with Santa we headed to Cracker Barrel for dinner which has become a little tradition for us. It was a much needed family night out. No volleyball, no soccer, no karate, no tumbling...nothing to do, but enjoy each other's company. Perfection!